I gave a talk recently to a group of students at the UW. Somehow, in my unprepared rambling I found myself talking about the difference between the extrinsic rewards of working for someone else and the intrinsic rewards of working for yourself. Having been a quasi-employer now for a few years, it often occurs to me that I should call up everyone who I’ve ever worked for and apologize for being a poor employee. It’s not that I think I ever did a bad job, per se. It’s just that the idea of work always seemed to me like something to be endured – or avoided to the greatest extent possible – for the sole purpose of making enough money to finance the things I really wanted to do. I had never experienced work as a process that was intrinsically rewarding. When Siri and I were still searching for a livelihood, we’d often lament that the jobs out there in the world were unappealing because the work itself is so far removed from the necessities of daily life. Somehow, we imagined that work could only be rewarding and meaningful in an existential sense when it was immediately tied to the daily necessities of housing and feeding yourself. Thankfully, though hard, the type of farming we do is quite a few steps above subsistence. Nevertheless, the never-ending onslaught of work necessary to the entire process and therefore necessary to our continued success does feel existentially meaningful in the way I imagined subsistence farming would. The drawback to such a hard-scrabble career is that sometimes, no matter how hard you do work, events beyond your control can hamper your success. This spring, we have been beset with a variety of difficulties that are making our lives tremendously difficult. The largest and most obvious challenge we’ve been facing this year has been the weather. Whereas last year our weather difficulties stemmed from too much heat and too little rainfall, this year we have the opposite problem. 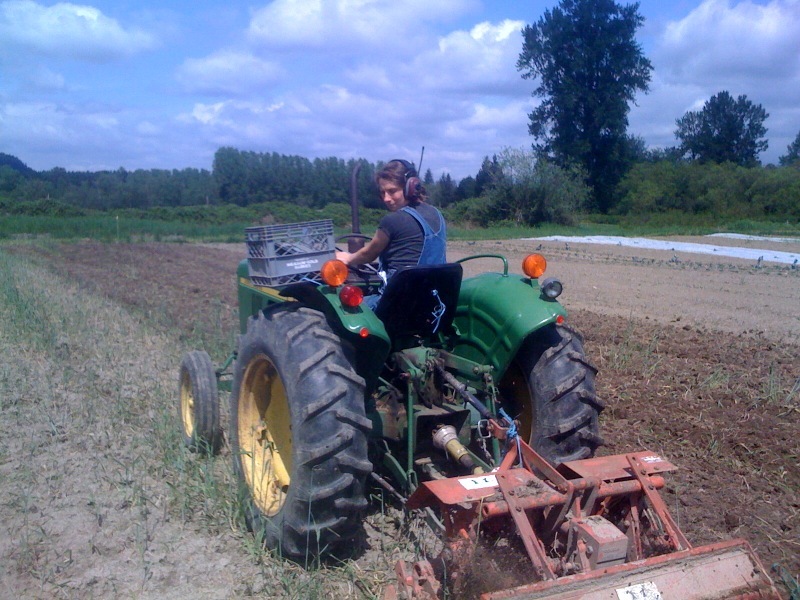 The way small, diversified vegetable farms like us operate is by succession planting – that is to say, we plant the same mix of veggies on a weekly, bi-weekly, or seasonal schedule (depending on the plant’s growing habit) to ensure a similar mix of things every week of the season. Our problem this year is that it’s been too wet to get beds into a condition that allows us to seed or even transplant into them. It’s very bad for the soil to work it when it’s too wet because it gets compacted to the point that there’s no more room for oxygen, which is essential both to decomposition of organic matter and to all the microbes that make nutrients from the decomposing stuff available to plants. So without beds to plant into, we keep missing planting dates week after week. 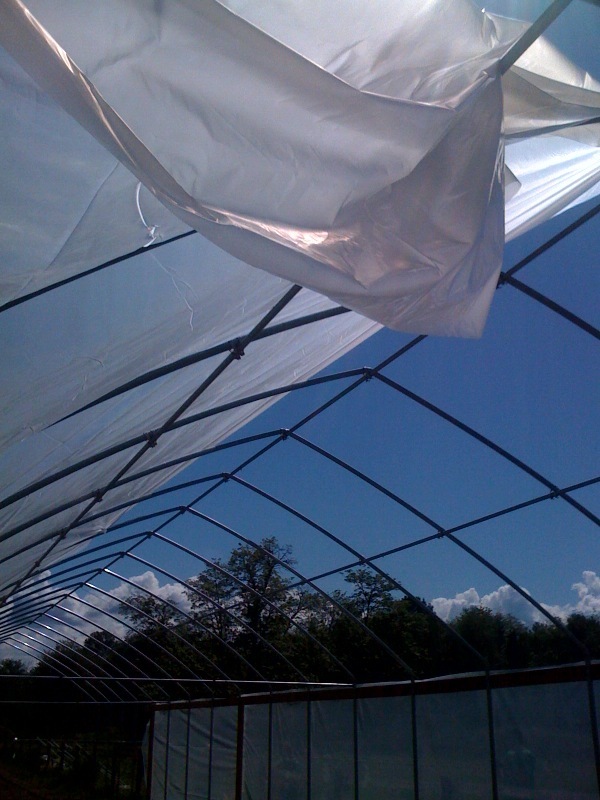 We have had a few weather windows where we’ve squeezed in weeks worth of plantings, but when the seeds doesn’t germinate because the temperatures were too low, or the seeds were planted too deep, or the seedlings get eaten by slugs, we don’t get another opportunity to make it up for these too-long gaps between planting dates. It’s troubling to consider what July and August could look like if we don’t get more opportunities this spring to seed beets, carrots, zucchini, cucumbers, and other summertime goodies. I know already they will be much later than last year, but how much later? I suspect we have had a fair measure of good luck in years past, and the law of averages is doing its part to remind us not to rely on past successes when considering future plans. The other big problem we’ve had this year is of our own creation. We took on a big infrastructure project this early-winter that was supposed to be finished by April 1st. 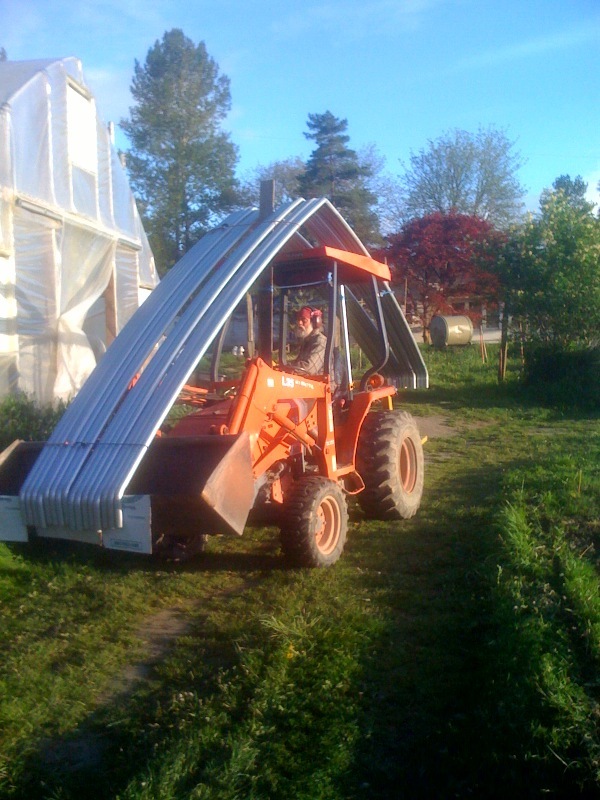 We decided the growing tomatoes in the same spot year after year was a bad idea, so we began building a new, very large and complicated greenhouse. As we probably should have predicted, the project was too ambitious and is still, months later, unfinished. Isolated from the rest of the farm, this wouldn’t be a huge deal. Unfortunately, as Farmer Dan likes to say, farming is a process, not an event. So when one part of the process begins to eat up an inordinate amount of time and energy, other parts invariably receive less time and attention. So during the few weather windows we have had, our resources haven’t been as ready as they should have been to squeeze in the dry-weather work. Hopefully, the greenhouse will be finished before all our sad tomato plants die in purgatory, but if not, next year we’ll surely have a really awesome greenhouse. Sigh. The impact of all this has been difficult on our psyche and our business plan. But despite the insecurity of it all, I still have trouble imagining doing something safer but less directly connected to my daily existence. In spite of a tremendously difficult spring, we are buoyed by the knowledge that we have an incredibly supportive community out there. It’s difficult when we have to tell our favorite chefs that we can’t sell them turnips or radishes because we have to save them for the markets or (in a few weeks) tell our favorite farmers market customer we didn’t bring turnips and radishes to the market because we had to save them for the CSA. But, as we like to say, these are the sorts of problems you want to have. The demand is there, if only the weather would cooperate so we can get working on the supply. I think it’s wonderful that you share the concept of intrinsic reward with students. It’s so often missing from career and work discussions and often we don’t understand the impact until we’re older and the lack of it has caused us stress, unhappiness and illness.